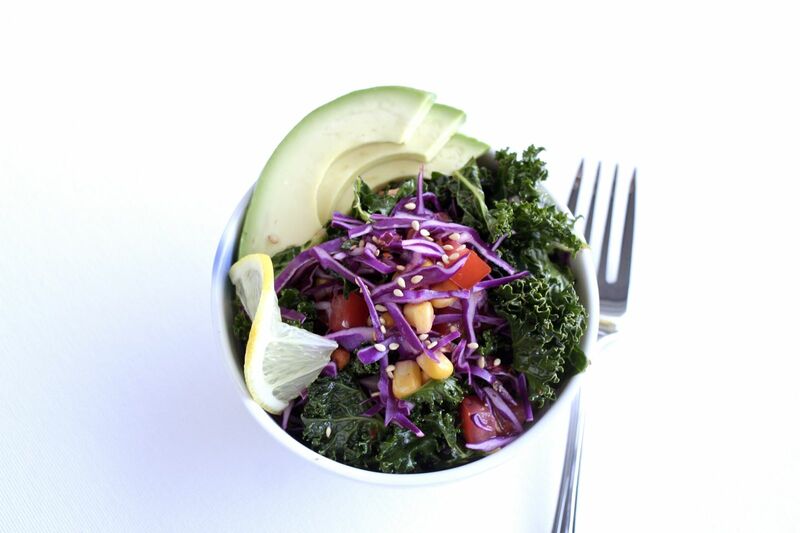 Kale isn't just a garnish. Although my sister-in-law teasingly says it is. This salad is a remnant from my days as a raw foodist--I did two 18 month stints several years ago, but that's another story. Every month or so I'll get a craving for this salad, it's fresh and super simple to prepare. I always feel healthier after eating this salad. Cook 2/3 cup quinoa according to package directions. Some people recommend toasting the quinoa first. If you do, they will pop like sesame seeds do when you toast them. If you're a raw fooder, you would sprout the quinoa, not cook it. Tear the leaves from the stems of the kale. Then tear or chop the leaves into bite-sized pieces. 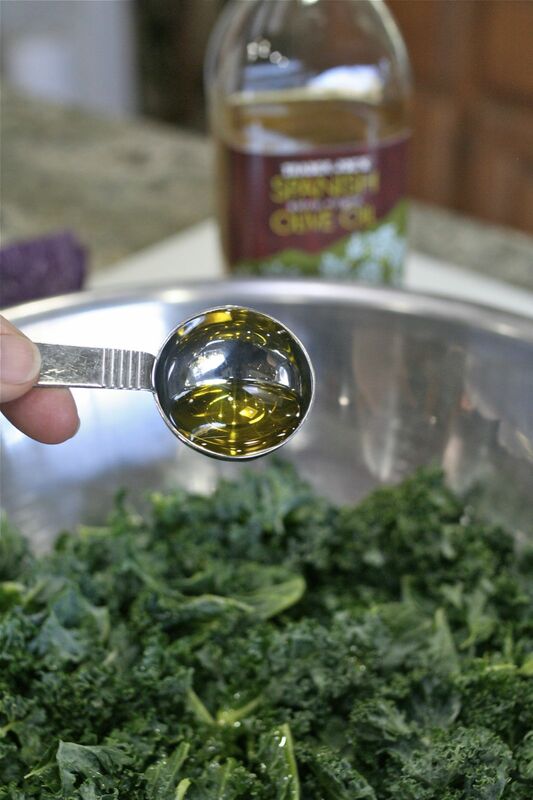 To soften the kale, you're going to sprinkle 1 tablespoon of olive oil over the leaves. 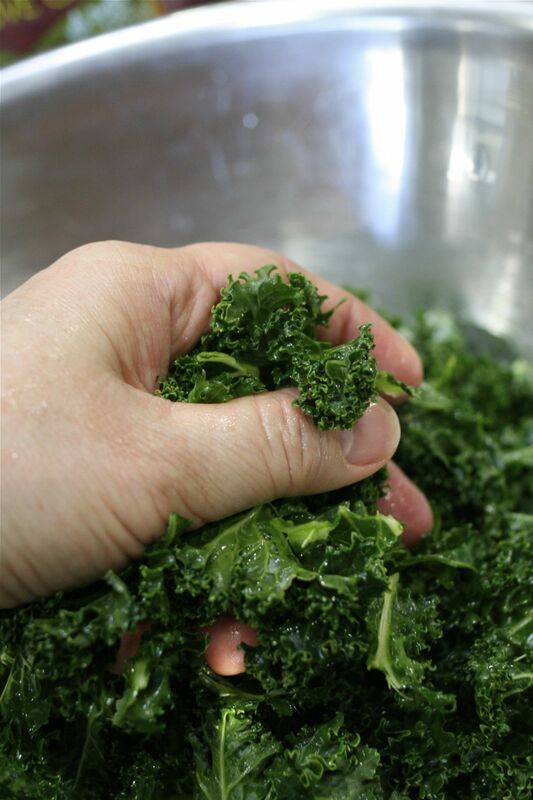 Give the kale leaves a massage by rubbing the oil into the leaves with your hands. It really softens the leaves. Add the other ingredients to the bowl. I also added a third cup of frozen corn. It adds such nice color. In the summers, when my dad grows corn, I cut the kernels right off the cob and add raw corn to the salad. If you eat the corn right after it's picked, the kernels are really sweet. Joe Taguchi once told me it's because of the sugar in the kernels, which turn starchy the farther you get from the picking time. Then, you need to blanch them. 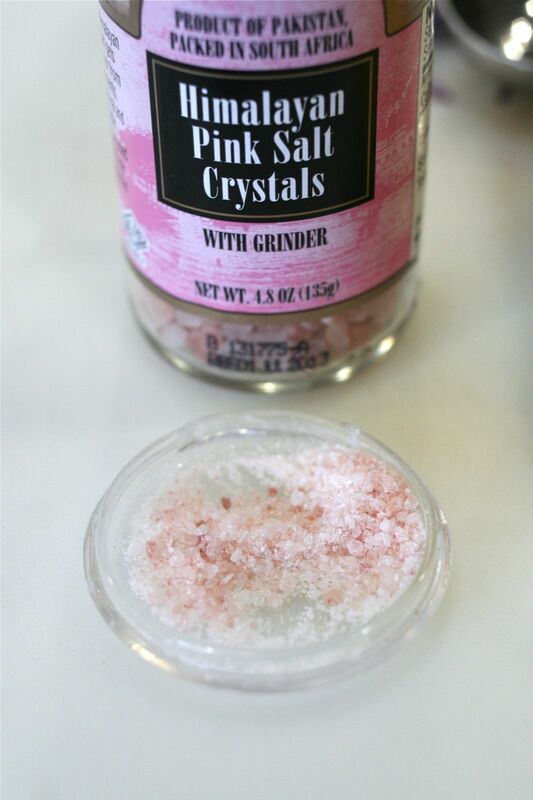 I'm trying out this Himalayan pink salt from Trader Joe's. With the cap on, grind the salt into the cap. Then you can see how it grinds and how much you're adding. Add about 1/8 teaspoon, or to taste. The oil from the leaves and the acid from the citrus make a light, fresh-tasting dressing. HOLY SMOKES! I FORGOT TO ADD THE QUINOA!!! I dumped it all back into the bowl, added the quinoa, tossed it again, adding a little more citrus juice and a couple more grinds of salt & pepper. Now that looks much better for a Kale & Quinoa Salad, doesn't it! I love the chewiness of this salad, and the fresh taste. I was a raw fooder two times for about 18 months each time. The first time was on a dare. 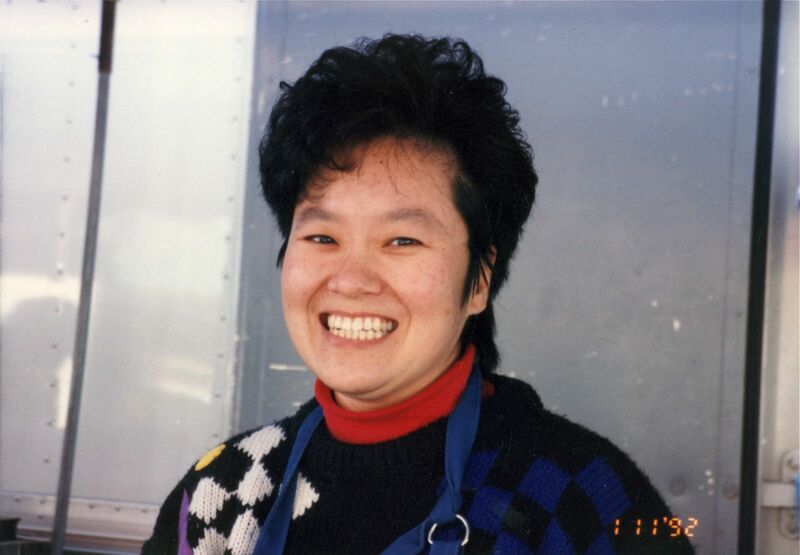 Years ago, I worked at the Whittier Farmer's Market for Taguchi Farms, friends and local produce growers. At the market, I became acquainted with the regular customers, getting to know them a little each week. One of the customers was a raw foodist and would talk to me about it each week, and little by little, I'd learn a skosh more about it and was encouraged to give it a try. Each time I'd smile and say, "Maybe someday..."
Until one day he said, "I'll bet you're afraid to try it." "I dare you to give it a try." Okay. I was a lot younger then. I'm a lot older and smarter now and wouldn't take a dare these days. I liked it, and it lasted for about 18 months. But I don't remember how much time was between each stint. The Sprout Lady was close to us at the Farmer's Market, so I did wheatgrass juicing too. Someday I'll tell the story of feeding wheatgrass juice to my family. That's me at the Whittier Farmer's Market working for Taguchi Farms. I was going to say, "Don't laugh." But it's okay. Go ahead and laugh! Look how cute you looked! Gary picked a good woman. I'm definitely a carnivore, but this looks delicious. I love kale but I've never had quinoa. Wow! love the hair! Your smile is still the bright and inviting grin we see now. 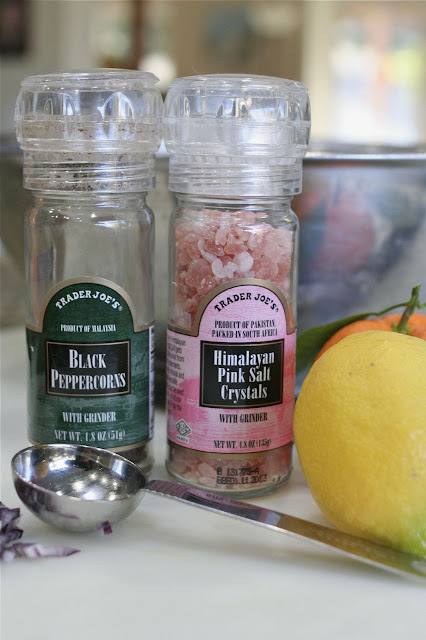 Love the stories that you're infusing with your recipes! We're going to the Long Beach Pops tomorrow evening and I'm going to make this for part of our dinner! Thanks Karolyn! 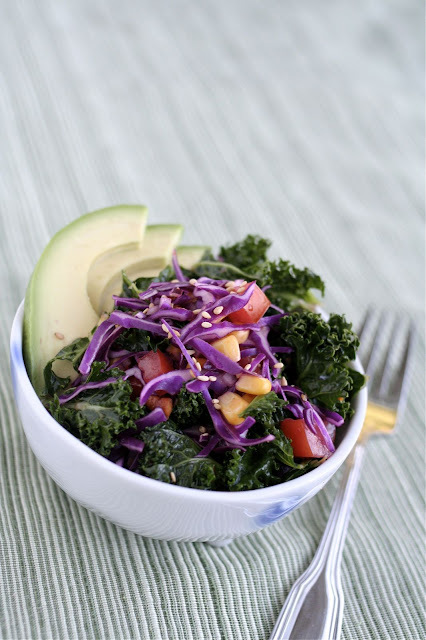 This is the best kale salad recipe I have ever had. My super picky kids asked for seconds!